Earlier this week, I read a post on Tracie Miles’ blog where she started a Marriage Challenge. She mentioned the book The Power of a Praying Wife by Stormie Omartian. I went through this book and others of Stormie’s a few years ago. They helped me realize how powerful prayer really is in my life. Tracie inspired me to go through the book again. As a matter of fact, I’m meeting a friend at the bookstore around lunch to make sure she has a copy to go through this with me. I want to challenge you to read through the book with me and share your insights here. I’m going to start Monday reading one chapter a day (Monday through Friday). I’m a firm believer in the weekends are family time and pretty much crazy anyway. There are 30 chapters so this will take us 6 weeks to go through and it will be well worth it — I promise you! So I don’t make everyone that reads my blog sick of seeing stuff about this, I’m going to post on Monday what chapters we are to read that week and then on Friday I’ll put up my thoughts on what’s happened that week. Go get your book this weekend and be prepared to start on Monday. Don’t worry about time. It might take 10 minutes. Surely you can spare that! Several years ago, God placed hurting women in the church on my heart. I thought then that I might become a Women’s Ministry Leader in the church we were going to, but several closed doors later, I realize my ministry is going to be online. I have had this kit sitting on my shelf for several years. I don’t recall ever once opening it and using it, and frankly, I feel guilty every time I look at it. I’m sure it has some great resources for someone out there. In the spirit of being thankful, I am thankful that I have too much stuff because it’s going to allow me to bless one of you. Leave a comment below (1 per person please) with a valid email (only I will see). I’ll enter you into a drawing for this Starter Kit. If you are not in a leadership position at your church, perhaps you can gift it to someone who is — or perhaps this is a gentle nudge to you from God that you are the one He’s calling up in your church. Regardless, it needs to leave my house and go to a good home where it will be read and used as intended. Comments close Monday, December 1 at 10 am EST. 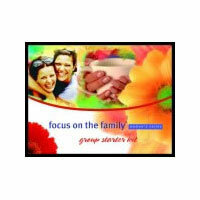 You can go to the Focus on the Family’s website and see what this kit contains.